If you are anything like me then you A) Have a dog and B) are obsessed with the previously mentioned dog. Below is another way to obsess over your dog! 1. Collect your Materials I used acrylic paints (also maybe enamel on accident), some fairly stiff brushes ranging from half an inch to an eighth of an inch, some paper plates, a rinsing cup (or your sink), a pencil (with an eraser), and a sketch pad. The Colors you will need are the colors of your dog, black, white, pink (red mixed with white) and a then a color for your background. My dog is brown and white and he looks best in blue so he got a blue background. I didn’t have brown paint so I first made orange then added in black to get to the right shade of brown. 2. Sketch out your dog I think this is the hardest part and probably took me months to decide what my dog would look like if he were a cartoon. 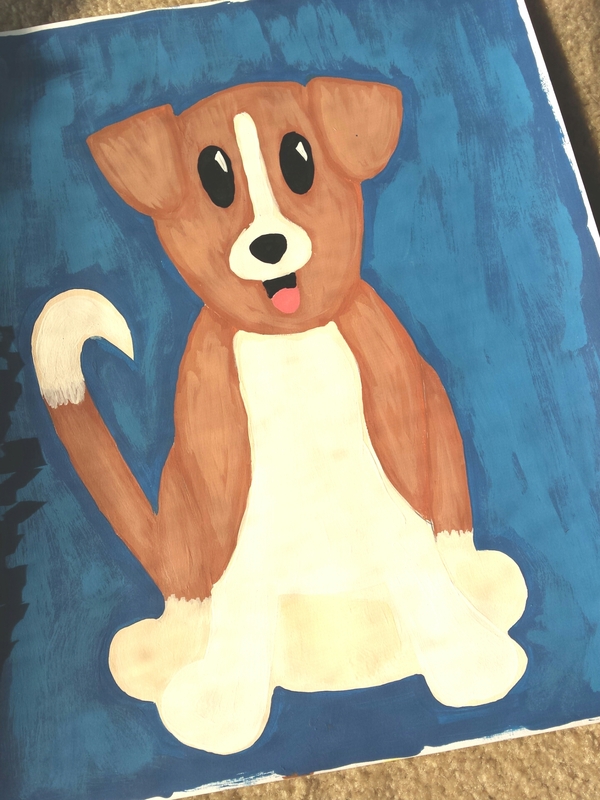 You don’t have to go with a cartoon version of your dog but it seems a lot easier to paint since cartoons by nature are not very detailed. Even then when I went to draw my pup on the sketch pad it look terrible and I erased it about 8 times until it looked how I wanted. It doesn’t have to be perfect and there can be erase marks everywhere since you are going to paint over them anyways. 3. Mix the main color (make sure you have enough for about 5 layers) of your dog and apply it to the appropriate areas in your sketch. Make sure you are covering all of the pencil marks with the paint. When you feel that the area is covered well and you cannot see the pencil marks mix a little bit of white into the original color and add another layer of the lighter color to what you have already painted but this time do not go all the way to the edges. Add a little bit more white again and, with not very much paint on your brush, add some slight texture with the lightest color. When you are done you should be able to see all the different variances of the color. That way your pup looks like he has some dimension. 4. Continue this theory with the rest of you sections and the background. For the white parts of my dog I started with a light peach (orange and a lot of white or brown and a lot of white) and then lightened the color up from there so he wasn’t flat white. 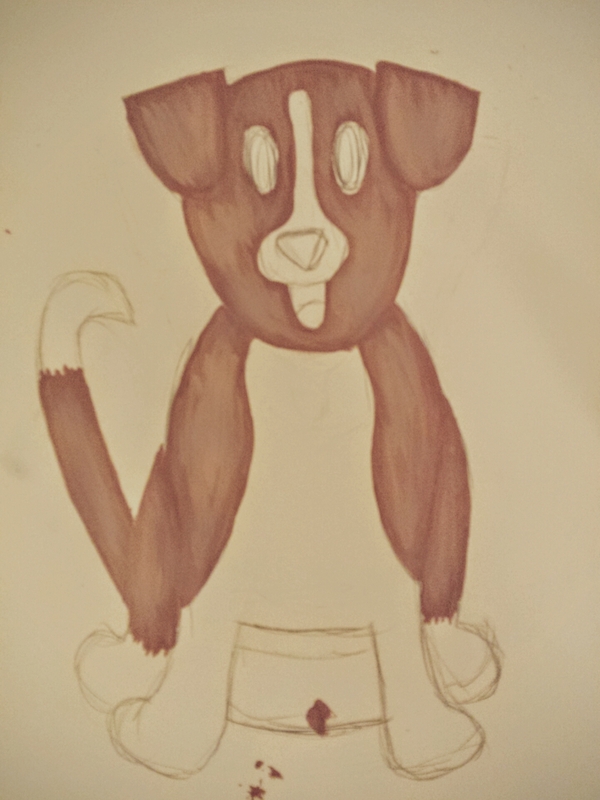 I also made his belly and front paws much whiter than the back paws to help differentiate. Don’t forget the little white dots in his eyes to make him look especially happy. This picture makes me laugh so much! When I hang it up I will probably never stop laughing. The next step with this project would be to make them for friends as gifts! Gotta share the joy!